I recently read a reader’s review of Aki’s Love Song and she said it seemed to her that the J-rock star, Aki portrayed in this M/M romance is based on Hyde and the Aki’s band, Spider’s Web, on Hyde’s band, Arc-en-Ciel. Pretty good guess, but only partially true. Though I’m a fan of Hyde’s voice and of the beautiful ballads on his Roentgen album like “Evergreen” and “Shallow Sleep”. 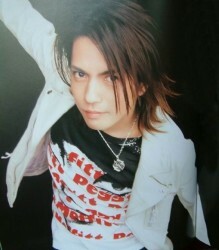 But Gackt was much more the model for Aki than Hyde. The man that Aki is, as an artist and a person is modeled partly on my imagination and a composite of what I reaad in Gackt’s autobiography, Ein No Yume. I was very moved by many of the things he told about his life. In this account, he sheds his usually inscrutable “cool” exterior and talks in depth about his emotional life, his fears and vulnerabilities. Wildly talented and dynamic, he just inspired the character of Aki with all his complexity and compelling personality. This entry was posted in Behind the Book by Sedonia. Bookmark the permalink. Your books are wicked cool! I stopped by just to tell you that, winner or no winner. You’re an awesome author! I have not heard about Hyde nor the band so I am happy to say, my next stop is to Google them. I broaden my knowledge when I read your blog. Can’t wait to read Ski’s Love Song. I thought Hyde too at first, but now I can see that it is Gackt all the way. It’s interesting to discover the factors that create a character and/or a story. I haven’t read Aki’s Love Song yet but have enjoyed many of your other stories. Thank you for the insight into the creation of your characters. I would love to know more about Aki’s Love Song – I have a deep interest in things Japanese, and I like groups such as An Cafe and Abingdon Boys School. 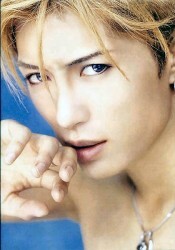 I’m not that familiar with Gackt, but I do like his looks! I am a huge fan. I look forward to reading more from you. I’d never head of Gackt before, and looked him up. Oh, my. I’ve got to read this book to meet this character. Gackt is absolutely beautiful, and I found he’s in a film with Demi Moore and Josh Hartnett, ‘Bunraku’…have to investigate that as well! I’ve not read this book yet but it sounds really good. I’ve never heard of the band Arc-en-Ciel what kind of music do they do? Where can you find it at? I adore m/m romances. I discovered Arc-en-Ciel a couple of years ago and have been a fan ever since. This book sounds good and will be added to my must have list. I am not familiar with either of these artists but the autobiography sounds interesting. I do like to hear about the background of the story. Thanks for the tidbit. I am familiar with some of Gackt’s work. I have the red and blue albums. I was very interested in Aki’s Love Song when it first came out, but got distracted. I have thoroughly enjoyed the White Tiger series and am looking forward to Aki’s Love Song, win or not!! Thanks not only for your work but this chance as well.